One might be forgiven for thinking that the era of chapels being built on private land had long since passed, so one might be surprised to learn that it is by no means such a rare occurrence as one might suppose. Even today, patrons exist who wish to establish new places of worship and some of them result in fine buildings and in most instances, they are also open to the general public for worship. Such was the case for the Chapel of Christ the Redeemer at Culham. Culham Chapel Trust engaged the services of Craig Hamilton to design a chapel in the classical style, which Craig Hamilton then interpreted and developed with his own architectural influence to produce a fine building with exemplary attention to detail in every respect. The chapel was already under construction when we were invited to offer suggestions for an organ. 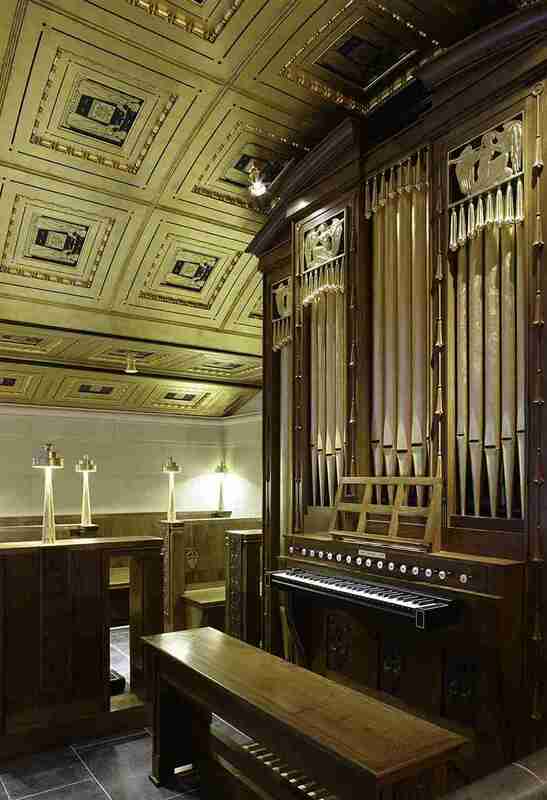 Space was provided for the organ on a small gallery, which also has room for a modest choir. The organ case was to be designed by the architect, in consultation with the organ builder and its overall size was to be modest. The space made available for the organ dictated that the instrument would either be a modest two manual and pedal organ, or a one manual and pedals of eight to ten stops. 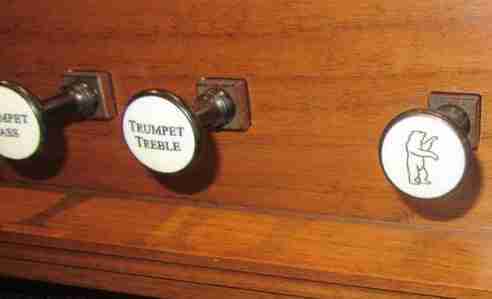 A two-manual organ would have been very modest indeed and as each manual would have to have some basic stops, the opportunity of introducing more characterful stops would have been limited. 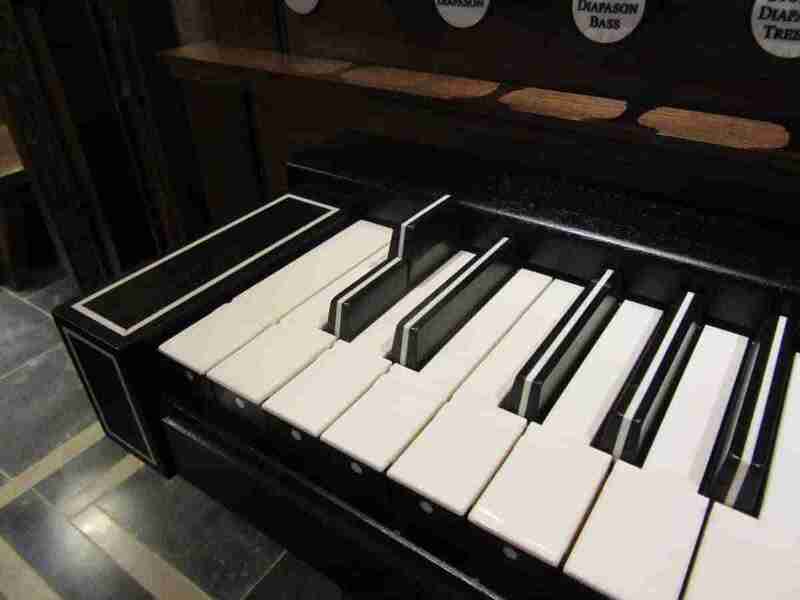 This led us to propose a one manual and pedal organ, which would allow for a greater variety of stops and colours with nine stops and the specification which ultimately prevailed. Having presented our proposals, the architect and the patrons’ representative engaged Dr William McVicker to guide them through what were probably rather different proposals, which ultimately led to our securing a contract. There followed a number of meetings to decide the details of the organ, which also led to interesting developments, in large part proposed by Dr McVicker. He suggested that the versatility of the instrument could be enhanced significantly if some of the stops were divided at middle C. Following on from that, the organ could be used to play much of the early English repertoire (as well as a significant part of the early Iberian repertoire) if the organ could have the old English GG and AA keys, and, of course, pipes for them as well. Initial exploratory design indicated this could be possible, except for the pipes for the 8ft Registers. 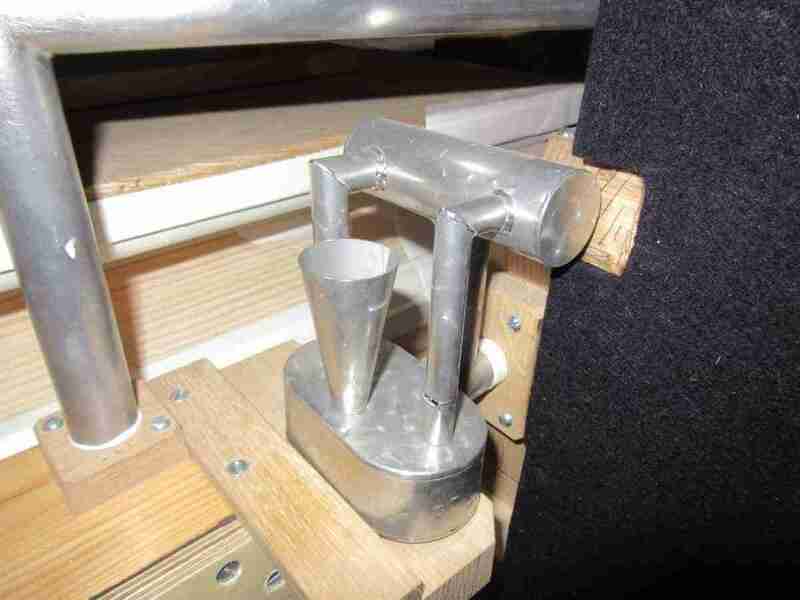 A way was found around this problem by pressing the GG and AA pipes of the Pedal Bourdon into service for the 8ft Diapasons. We were all on something of a roll by then and other ideas followed one after another. A Cymbelstern would be an appropriate addition for Christmas time, and bird song for other occasions. And if an organist wanted to perform Iberian Pastorales a thunder or drum pedal would also be necessary. It looked as if that would complete the instrument until we mentioned in passing a number of other elements that some organs had, not suggesting these should be added too, merely to demonstrate how organs do not need to be staid. This led to the most unusual suggestion, not by us, but by the Patrons’ representative. Amongst other organs mentioned, was the Gabler at Ochesenhausen, with its famous ox which comes out of its stall on the Rückpositiv. At this point, the patrons’ representative’s eyes lit up and he asked if we could provide a bear which would come out of the case, and that this would be a surprise for the patrons and he would pay for it. Whilst admitting we had no idea quite how this could be achieved, we agreed to look into the possibility. Why a bear? A bear references the Patron's name. After some investigation into the mechanism of the ox an Ochsenhausen provided by the person who restored it, that option was discarded as too complex and (we gathered) very difficult to set up. We did some experiments ourselves with a wooden piston, which was promising and even managed to construct a large, wooden Regal with a thin tongue and a slow-opening valve which created a passable bear sound when the bear was fully retracted or fully extended and a gilded bear was provided by the architect. The patron was more than delighted. 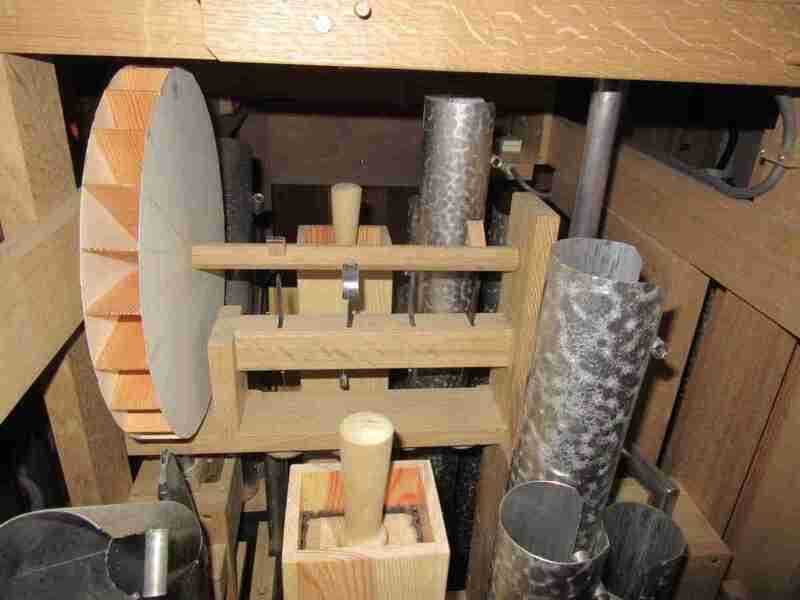 The Cymbelstern is wind-operated and, insofar as we are aware, the only wind-operated one made in the UK since (possibly) the organ Thomas Dallam built for Queen Elizabeth I to present to Sultan Mehmet III of Turkey in 1599. The bird-song utilises pipes inverted in a liquid in the usual way, but modelled on that of the Italian organ in the Royal Academy of Music and very much smaller than most such nightingales (as they are called). The drum or thunder effect is operated by a pedal which progressively adds the bottom six notes of the Bourdon, starting at the bottom note. The casework was designed by Craig Hamilton and made by Houghtons of York. The keys and pedals were given special treatment to set them apart and even the bench was designed by the architect. The organ sits behind an arch, which meant that it had to be voiced relatively boldly to be effective in the body of the chapel. With its somewhat unusual attributes, it enables an organist to explore much repertoire that can only be played on few instruments. It leads the congregational singing effectively and choirs seem enjoy being accompanied by it. The organ was completed in 2016. Building organs is always fun, but when opportunities of this sort present themselves, it adds welcome spices to the project. View the Specification of the organ the Chapel of Christ the Redeemer, and the scales are here.